In the concluding plate of the previous series, The Bottle Has Done Its Work — It Has Destroyed the Infant and the Mother, It Has Brought the Son and the Daughter to Vice and to the Streets, and Has Left the Father a Hopeless Maniac (1847), Cruikshank had anticipated the trajectory of the sequel, from the adolescent son and daughter's visiting their crazed father in the asylum for the criminally insane through to consorting and carousing with criminal types in the first three scenes of The Drunkard's Children, continuing the downward spiral of the gin bottle to the utter destruction of the next generation. As inevitable as the father's gin-madness and the mother's murder are the son's being transported and the daughter's drowning herself in the Thames after becoming a prostitute. Perhaps what is not so inevitable is the son's death in the infirmary on the prison ship rather than joining such notable London thieves and pickpockets as Jack Dawkins ("The Artful Dodger") from Oliver Twist down under at Botany Bay. Cruikshank precludes the possibility of any sort of happy ending for the wayward son. In a later Dickens novel, the street-thug Abel Magwitch makes the same journey but redeems himself by labouring on behalf of the blacksmith's boy who assisted him after his escape. Cruikshank, in contrast, consigns his boy-thief to the oblivion of the Atlantic. After Cruikshank "took the pledge" to abstain from imbibing spiritous liquors in 1848, the calibre of his work began a long, slow decline. Despite his mistaken notion that drink causes social problems rather than that alcoholism is one of the consequences of poverty, his second sequence derives considerable narrative power from the double tragedy of two young lives wasted in the Great Sink of London. With its perfect realisations of the low life of the metropolis — the gin-palace, beer-shop, betting-parlour, dance-hall, and three-penny lodging-house, The Drunkard's Children proved as popular as The Bottle with the lower-middle and working classes. David Kunzle in "Cruikshank's Strike for Independence" has labelled the 1848 folio "perhaps the artist's last truly creative performance, and his only truly successful attempt to combine the covered dual role of artist-as-author" (p. 169). But, engaging as the eight images are, Cruikshank leaves narrative gaps between them that even his longer captions fail to fill. How, for example, does the daughter become a prostitute and for what crimes is the son sentenced at the Old Bailey to transportation? The result is a hyper-realistic comic strip with holes that the viewers must fill for themselves. Otherwise, however, The Drunkard's Children should be regarded as a sequel to The Bottle in that it follows the curse of alcoholism from the older to the younger generation, wiping out both parents and children. 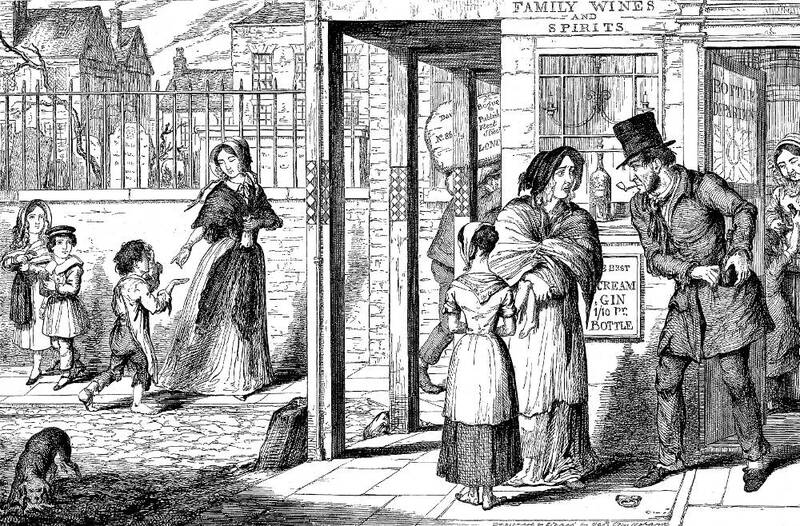 The gin shop depicted here has customers that are not quite on a par socially with those of the establishment that Cruikshank drew for Dickens's Sketches by Boz in 1836, — and the lame and even children are imbibing greedily. 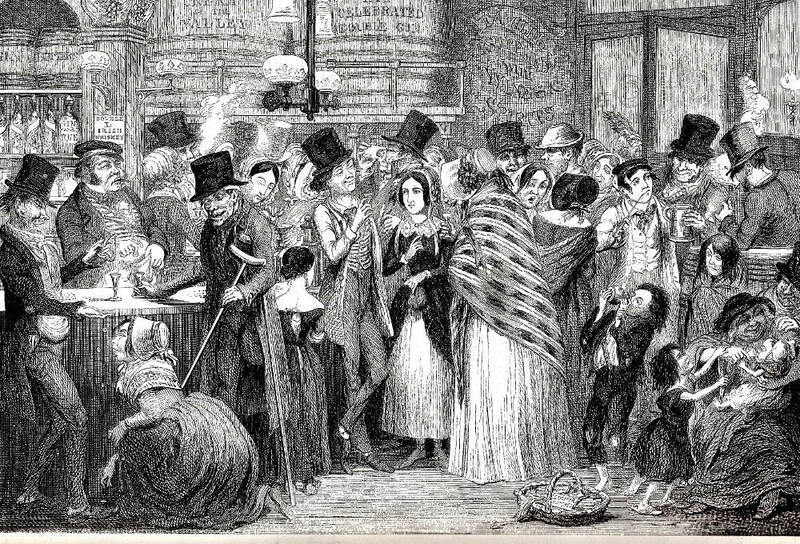 However, whereas the huge barrels of gin with fanciful titles dominate the establishment in the 1836 illustration, here Cruikshank's focus is the mixed-gender crowd of drinkers. Thirteen of the figures (including the cigarette-smoking manager, left) are males, fifteen females — so that one might conclude that alcoholism, the bane of the working classes, afflicted members of both sexes about equally. At the very centre, with a serious and thoughtful expression is the drunkard's daughter, small glass in hand. The brother, smoking a long-stemmed pipe, is in front of the door to the right; apparently an older man is trying to persuade him to drink from a substantial tankard. (In the interim between his work on the previous series and this, in addition to taking the Temperance pledge, George Cruikshank, a life-long smoker, had renounced the smoking of tobacco as a noxious, filthy habit.) The long-haired youth immediately beside the daughter here appears again in the dance-hall (Plate 3), although there she is dancing a polka with another well-dressed artisan. In the dancing scene, Cruikshank individualises the animated dancers by the variety of their movements and poses, but only such details as the huge shawl (right of centre) readily enable him to distinguish individuals who are neither grotesques nor children. In his "Notes on the Illustrations," Vogler describes the particulars of each scene, focussing on the recurring figures of the Drunkard's son and the Drunkard's daughter, who are almost lost in the crowded rooms of the first three illustrations, in contrast to their isolation in the cold cell of their maniac father in the last scene of The Bottle. 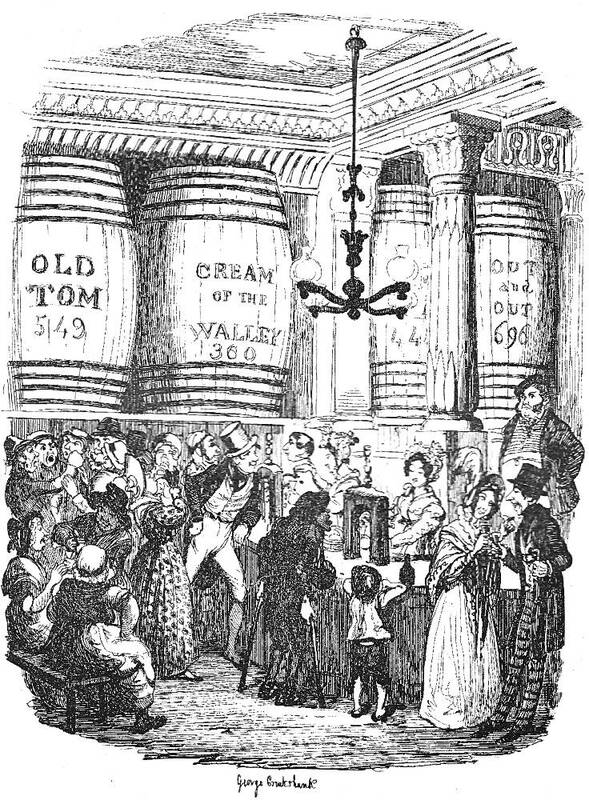 Curiously, he does not describe the setting of this first, densely-packed barroom scene as a "gin-palace," although its detailing suggests that it is somewhat like Cruikshank's illustration of such a place in Sketches by Boz (1836), with its gigantic barrels of gin dwarfing the imbibers. By this time Cruikshank had become a convert to the temperance movement and thus had an​assured audience for this work regardless of whether it attained the success of its predecessor.​. . . . Once again the work is most effective in the expensive hand-colored issues. There seems to be no appreciable difference in the artist's attitude towards his subject in the two suites. The sequel, neither more nor less doctrinaire than the original work, is more dramatic and creates​more historical interest than the original because its designs portray a variety of settings and are replete with character types. The drunkard's son appears in six of the designs; the daughter, in only five. Since the captions for The Drunkard's Children are longer and of more importance than those for the first series, the second suite becomes more of a narrative. . . . . This suite gives scenes of lower-class Victorian life that were seldom portrayed in the arts of the period. [p. 161]. 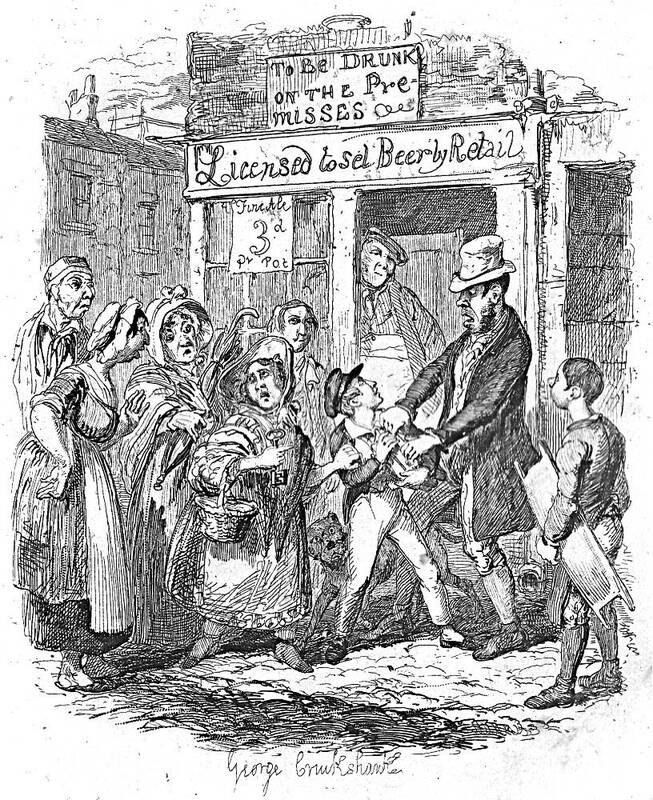 In his illustrations to Sketches by Boz,​ Cruikshank first approached intemperance from that point of view in which he treated it afterwards in The Bottle.​ His view of the gin-shop [above, left] comprehends a complete story. 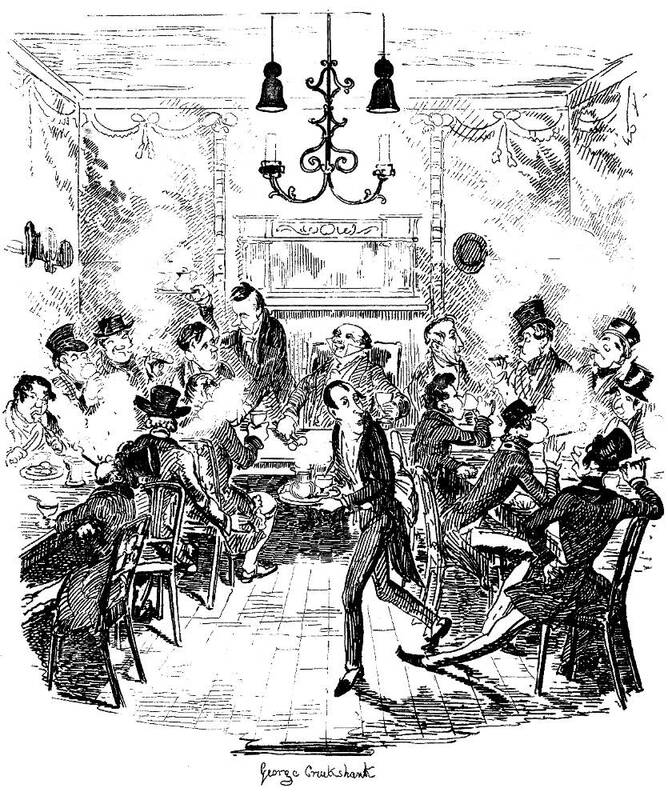 Whereas in illustrating Dickens Cruikshank had to attend to the details in the text and shape his conception of the drinking scene accordingly, much to his delight in his project for the Temperance Union he could control the storyline in his own "wordless" novella, The Drunkard's Children. In his continuation​ of this sordid tale of two generations destroyed by gin, Cruikshank had to rely only on repeating characters, whereas, in The Bottle, he was able to repeat a single room to demonstrate the family's decline. Moreover, in the 1848 sequence a number of the scenes are so highly crowded that the viewer sometimes has to search for the continuing figures of the Drunkard's son and daughter, upon whom the illustrator is relying to provide visual continuity.​In this sequel, Cruikshank employs a number of settings associated with proletarian London: a gin-palace here, a beer-shop, the dancing-rooms, a three-penny lodging house, the courtroom of the Old Bailey, a lockup, an infirmary aboard a prison transport, and one of the newer bridges across the Thames in The Maniac Father and the Convict Brother are gone — the Poor Girl, Homeless, Friendless and Deserted, Destitute, and Gin-mad Commits Self Murder.